If you are looking for quick tutorial for how to write a blog post that gets lots of attention online, this post is for you. Are you curious about how we often create long form of content without compromising the quality? Just go through this post and you’ll know all the tips on how to write a blog post that gets attention and traffic from search engines. If you’re following this blog for awhile, you already know that we create long form of content. In fact, there’s a massive guide on best affiliate programs which is over 16,000 words long. Do you want to know how to write such massive yet engaging content? Here’s a step by step content creation strategy we use here at Bloggers Passion. It all begins with coming up with ideas for your blog posts. Firstly, you need to decide the topic for your blog posts, only then you can either brainstorm or use blog topic generator tools to come up with new ideas to write about. If you already have a list of topics to write about, you can go ahead with selecting one of them. If not, choose a post topic by browsing other blogs or by going through latest trends, news etc. We also recommend you to check out the two places online for brainstorming topic ideas for your blog in 2018 and beyond. Quora: One of the most popular platforms which is used by millions of people online in recent times is Quora. If you’ve not created an account on Quora yet, you should better do it now. Not only Quora gives you a wide range of topic ideas but it also helps you write answers where you can actually include links your own blog posts to generate more traffic to your sites. Buzzsumo: We use Buzzsumo extensively before writing a post. It helps you easily find the most popular content in any industry. It gives you tweets, social shares, and the popularity of topics that you want to write about. Perform keyword research and come up with at least one primary idea that you can include within your blog posts. Here’s an excellent tutorial on using SEMrush to perform keyword research with ease. Also make sure to understand the importance of using long tail keywords as they are very important. To begin with keyword research, you need an account with SEMrush and if you don’t have an account yet, you can use this EXCLUSIVE link to get 14 days free trial with SEMrush Pro account which is worth around $47. Once you’re done with the keyword research, you can include your primary keyword in your title, meta description, image alt tags and so on. So how do you make my blog content SEO friendly? If you’re using WordPress, install WordPress SEO by Yoast as it helps you easily optimize your content for search engines. Finish writing your blog posts first, optimize for search engines later. Here are few more SEO tips that work like a charm. Before, you even start writing your blog posts, you need to outline your content. Outlining your content helps you easily create even long form of content quickly. You should have clear idea about what you are blogging about and what kind of references you’re going to refer while creating content. Pro tip: We always use Google Docs for writing blog posts along with the outlining. It helps you save your data even while you’re offline so your data won’t go anywhere even if you see any sudden wifi issues. Once you’re done with the topic selection and outlining, it’s time for you to write. It’s always better to find the right time when there are no distractions for you while writing. You can also use Pomodoro technique (where you work for 25 minutes and take a 5 min break in between) to write without having any distractions. Remove unwanted words ruthlessly. As a rule of thumb, for every 1000 words we write, we cut down at least 200 to 300 words to make the content “tight”. The key here is not to write long form of content but to use only those words which are extremely needed and avoid the sentences that don’t add any value. Divide long paragraphs into short. You can cut the long sentences into two and also cut down long paras into 2 to 3 lines to make it easy for your readers to digest your content. As a rule of thumb, make sure to edit your content in such a way that even a 5th grade student should understand what your content is all about. The average blog post takes 3 hours 20 minutes to write. For the last four years, Orbit Media done a survey of 1000+ bloggers and this was one of the questions we asked. The first year, we found that the average was about two and a half hours, but that number has increased over the last few years. If you carefully observe their survey data, you’ll notice that the bloggers are now spending more time and energy in their content creation than past. We need to keep on adding relevant and high quality content in the form of blog posts on our blog if we are aiming at building lots of search engine traffic, making money from our blogs and building a huge community of readers on our blogs. Sometime we find it really hard writing a blog post daily as it can take lots of time if you haven’t planned your blog posts properly. You can easily create an effective blog post in 90 minutes time even if you have the killer formula about how to write a blog post for your blog. First, you need to decide the topic for your blog post. If you already have the list of topics, you can go ahead with selecting one of them. If not, choose a post topic by browsing other blogs or by going through latest trends, news etc. You can use sites like Quora to choose topics. Then, you need to create an interesting title for your blog post. You should thought of using targeted keywords in your title. You should create a seo friendly and unique title which makes sense. Your blog title will be first seen by your blog readers and visitors on search engines. And if you are unable to impress them with your post title, they will not be coming to your blog. Before, you start writing your blog post, you should have clear idea about what you are blogging about and what kind of material you will be using in your post. It would be more beneficial if you could use list types or headings etc in your post content as I myself have noticed blog posts carrying lists doing great on search engines and readers on a blog also love those blog posts type. Once I’m finished off writing my blog post, I will do the editing process. I will read my blog post 2-3 times to fix spelling, grammatical, syntax errors or sentence structure related errors. With this, I would try to make my post error free and easy to read for my blog readers. Then I will start the publishing process for my post. I will add it into my blog admin panel. Apart from text, I try to add related images and videos if available to make my blog post more attractive and search engine friendly. With this, I may add few links to my own blog posts or external blogs where they add value to my blog post. Once I’m fine with my current post contents, I will hit the Publish button or may schedule it so that I can publish it in near future. If you don’t promote your blog post, your job will be half done. Now you need to promote it on social media websites where you have an active presence. I used to share most of my blog posts on Facebook, Twitter, Google Plus etc kind of popular social media websites. This helps in faster indexing and creating some instant backlinks for my newly created post. Here are some of the important questions you might want to read if you really want to create amazing blog posts that go viral online in 2018 and beyond. #1. Where can I find inspiration for writing blog posts? Just make sure to use headline generator tools like Portent, Tweak Your Biz, HubSpot blog idea generator to enter any keywords of your choice and start you’ll have unlimited blog ideas to write about. #2. How do I write blog posts faster? Writing blog posts faster takes a lot of practice. You need to write at least 500 to 1000 words every single day if you really want to create content quickly. Also make sure not to distract yourself while writing (turning off notifications, keeping your mobile away always helps!). Don’t edit while you write as it is one of the most common mistakes people make while writing. You can edit and remove words or become a grammar nazi anytime you want but when you’re writing, focus just on writing. That’s how you write blog posts faster. #3. What do I write my first blog post on? This is one of the most frequently asked questions by a lot of new bloggers: “what do I write my first blog post on”. Seriously there’s no proper answer as it is your first blog entry so you can literally talk about you or your journey and tell your audience why you started it along with the details of what your blog will be mostly about. Otherwise, if you really want to get started right away, you can pick any popular topic (or controversial topic) to write your first blog post. Just make sure whatever you write, spend extra time as it will be the first blog post which will set the tone for rest of your blogging journey! #4. Which is better to write: long blog posts or short? It really depends. If you’re running a poetry blog, there’s no need to churn out 10,000+ word articles as most poetry is short and sweet. That being said, search engines like Google prefer long form of content. The longer your posts, the higher your chance of appearing in first page results. 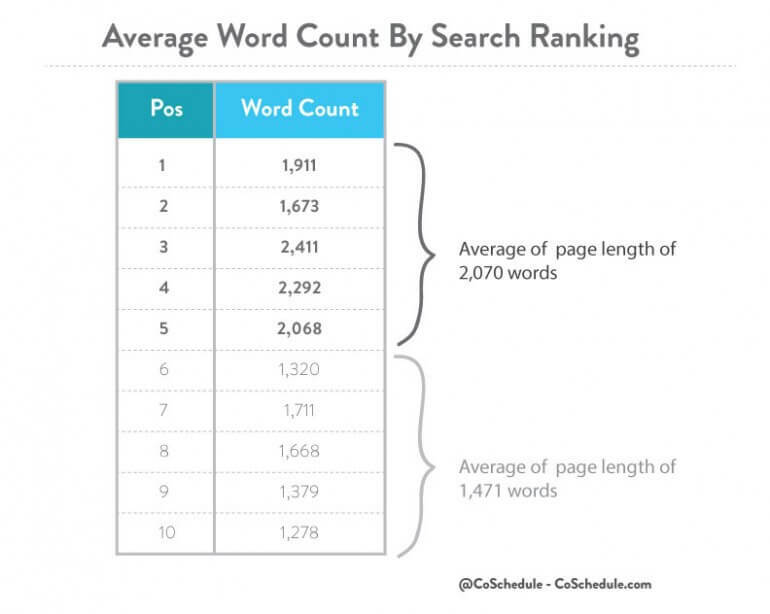 At an average, most of the top 10 search results have an average word count of around 2000 words. The reason is simple. The longer your posts, the more easier for the search engine crawlers to identify what your content is all about. Long posts always work well, just look the following image. An ideal blog post should be in the range of 1000 to 1500 words to ensure enough keywords in order to get first page rankings in the search engines (no matter what industry you are in). Blogging is the quickest way to generate more search traffic. If you need more search traffic, you need to have proper content in place. That’s why you should know how to write a blog post properly that attracts both people and search engines. Hopefully the tips mentioned here help you on how to write a blog post that always creates buzz online. Let us know if you’ve any questions in the comments. Nice tips you give here. Also let me add the importance of a good taxonomy for post before publish it. Tags and categories should be well organized and all post labeled under its category, and many tags as possible. I like your blog, Thanks ! Yes writting a engaging post is an art. Deciding the write title is really important because readers are not impress from the post title the are not going to read what you have mention in the post wheather it is informative or not. As said First impression is last impression. Its sometimes a good idea to have a set structure to your post. Firstly a good post title summarizing your article. Then in your first paragraph you could meantion what the article attempts to achieve or what it is about. In the body of the article various points or a step by step guide. You could then end the article with a conclusion summarizing the main points of the article. The above article is very informative. Actually i want to know how to find the duplicate article. Is there any tool?? recommend “copyscape.com” to you. hope helpful.